Do you have passion to reach out to the elderly in Potong Pasir? MACE is a after-school Youth Activity Centre in various secondary schools supported by the MOE. Be part of a team that plans meaningful programmes and activities for youths as part of a structured drop-in activity to encourage bonding, imparting of values or skills to youths. 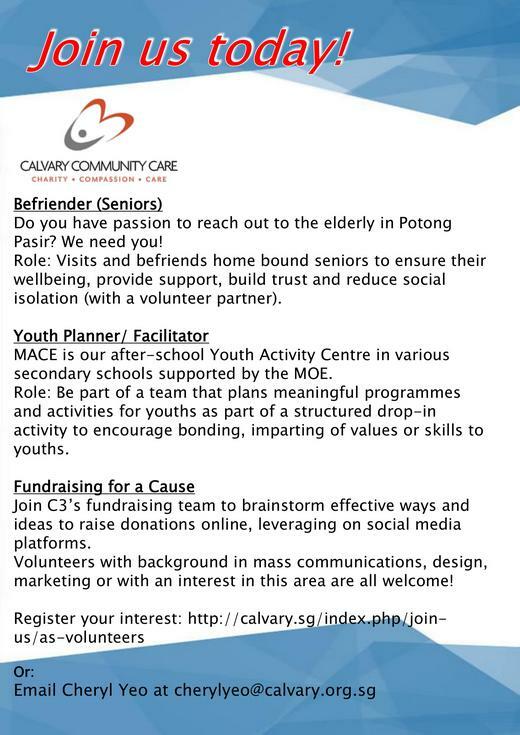 *C3 is looking for volunteers who are interested to plan and design programmes for youths. Examples will be provided. Join C3’s fundraising team to brainstorm effective ways and ideas to raise donations online, leveraging on social media platforms. Students with background in mass communications, design, marketing or with an interest in this area are all welcome! For any enquiries, email Cheryl at cherylyeo@calvary.org.sg.